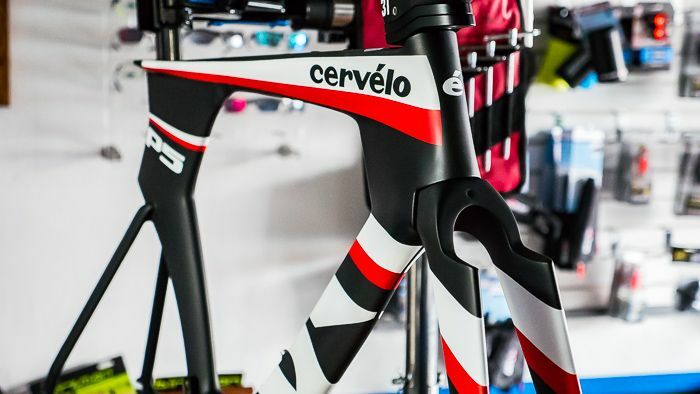 Cervelo P5 Six framesets in black/red color. The "Six" in P5 Six refers to the fork's aspect ratio (6x longer than it is wide). This results in the fastest fork possible, but does not fall with the UCI's rules for time trialing events. 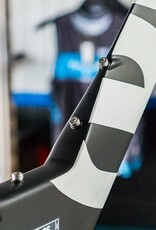 For this, Cervelo designed the P5 Three fork (3x longer than it is wide). 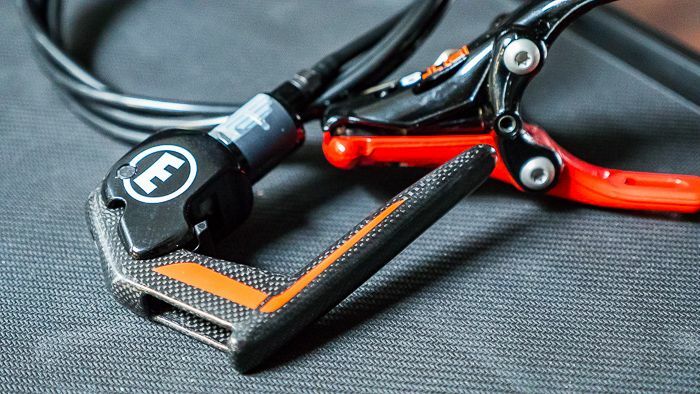 The fork is full carbon fiber on both the "Three" and "Six" series, and tapers from 1 1/4" to 1 1/8". 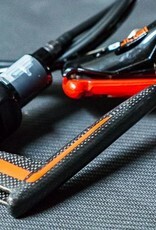 This helps to improve stiffness and cornering. The frameset itself is a lesson in intelligent design and component integration. All good triathlon bike fits start at the cockpit, and for this Cervelo partnered with 3T. The goal: to design an integrated aerobar that is clean and adjustable. The result is a very streamlined and light aerobar. The bar's reach is adjustable from 65mm to 115mm. A "High V" or "Low Mount" attachment, combined with a selection of spacers, offer 12cm of stack adjustability. Finally, the armrest themselves are width adjustable from 14.5cm to 20.5cm. For those running Shimano Di2, the "Junction A" box can be stored within the stem . 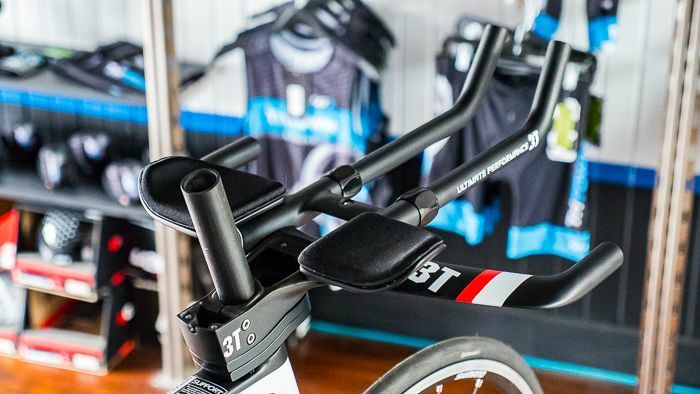 Our only complaint with the 3T Adura aerobar is it's lack of tilt adjustability. 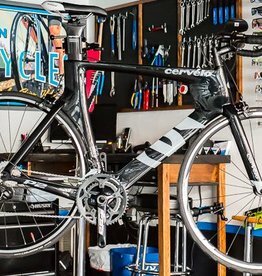 If you need this feature consider checking out the enviable Cervelo P5x. Hydration and nutrition needs are addressed with bosses on the down tube and top tube. 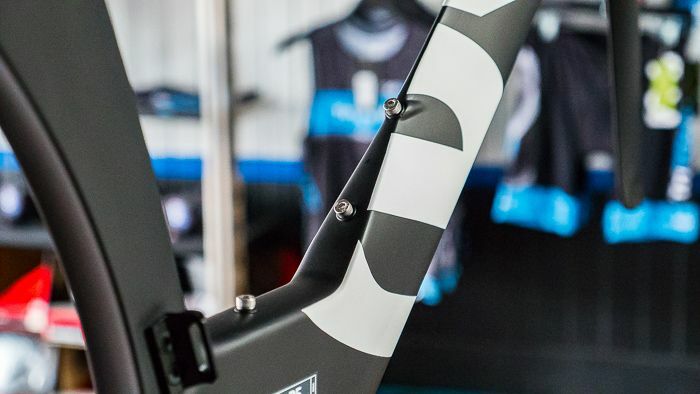 A third set of bosses on the aerobars allow for an aerobar hydration system. 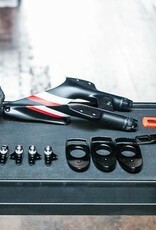 Many behind the saddle systems are available to work with the seat post or your saddle of choice. 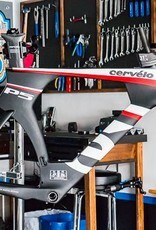 As with all Cervelo's, the P5 uses the "BBRight" bottom bracket. 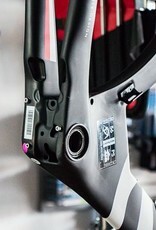 Cervelo's proprietary and asymmetrical "BBRight" BB's are stiff and compatible with most cranks. The BB itself comes with the frameset. Mechanic's Note: we do not recommend Pioneer Power Meter cranks on Cervelo bikes. 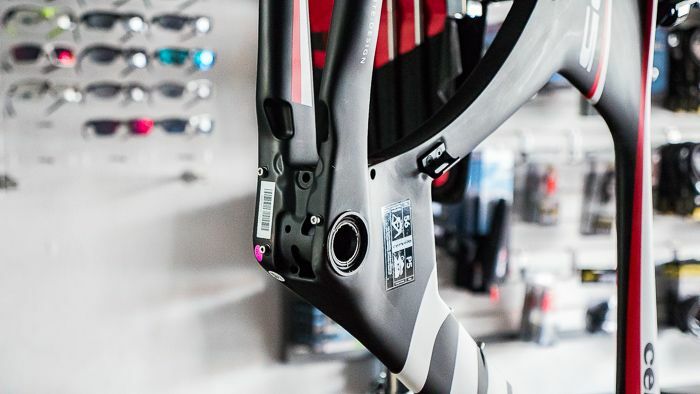 Cervelo's asymmetrical BB design makes for clearance issues on the left crank arm. 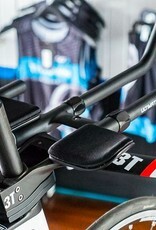 Integration continues with a hidden pocket behind the BB to store a Di2 battery. This covered opening also helps with cable routing and rear brake installation. 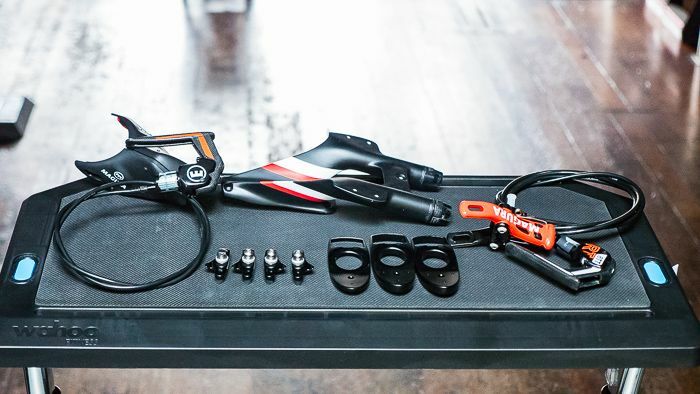 Included Magura RT6 hydraulic brakes takes care of stopping duties. The RT6 brakes are a great choice for this bike, requiring almost no maintenance. The brakes are adjustable at the brake lever itself (as opposed to the caliper). This makes most brake adjustments quick and easy. 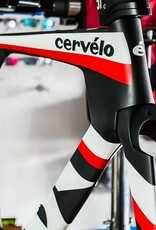 Cervelo includes aerodynamic fairings to shield the front and rear brakes. For those who want options: almost any front brake will work with this bike. The TRP center pull rear brake will work as a rear brake if desired. Note the provided front fairing will not work with any brake other than the Magura RT-series. We recommend riders who use rims that are 25+mm wide to shave their pads down to improve brake modulation. 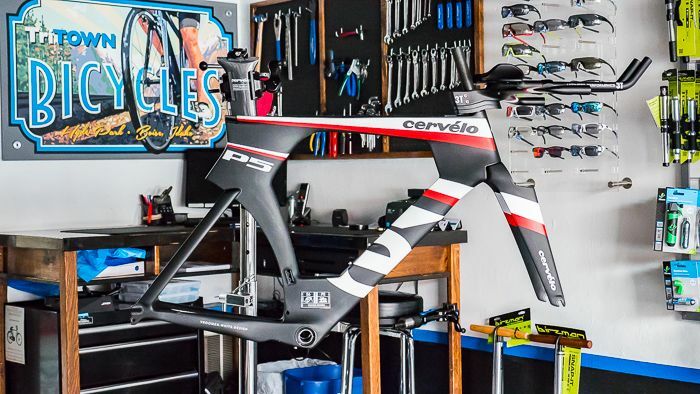 The Cervelo P5 Six has been on the market for more than a few years now. Despite this, it continues to dominate at races of significance due to it's proven design. If you want a bike that leaves the rider no excuses, this is the frame for you.